Because everybody is interested in my opinion. This is going to be a shorter post than usual, since this was actually a pretty straightforward modification. 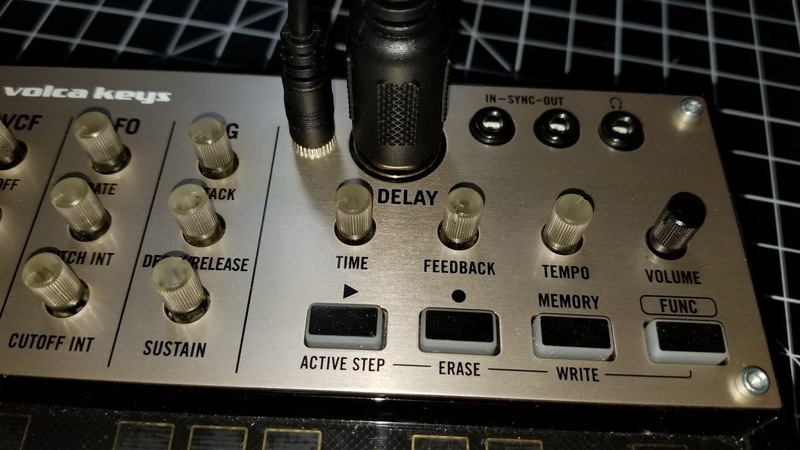 I wanted to add a MIDI out port to my Korg Volca keys. People have done it before, and there are plenty of posts around the internet detailing the process. 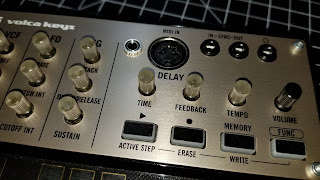 But one thing they didn't detail was how to add a more Volca-friendly 3.5mm TRS jack to handle the MIDI. One of the nice things about the Volca series is how consistently sized they are. I didn't want anything sticking out or crowding the controls. Attaching a raised, 5-pin MIDI jack to the side was out of the question. I still wanted it to fit in my Volca rack with the others, or even in the Sterilite pencil box I use to protect it when I bomb around (seriously, it was 50 cents at a garage sale and might as well have been made for a Volca). 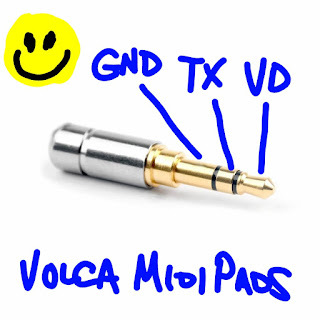 So I wanted to use a regular, 3.5mm stereo jack for MIDI, one that would sit nicely with the rest of the jacks on the face of the Volca, and one that used the "standard" (there is no standard) cable style instead of the Korg-only style. Even though the Volca is a Korg product, I'm hoping I can source any future cables or adapters a bit easier if they're not specialised. The trick was getting the pins to match up so my generic 5-pin adapter would actually transmit data. I used the pinout detailed in the post I linked to above, and then gave it my best guess. There was a bit of re-soldering, but now we can all learn from my trial-and-error. First, I cut three wires a little long, then wrapped them around the circuit board to where the jack would be mounted on the front panel. I cut them shorter, leaving a little extra just in case. Then I soldered them to the pads Korg thoughtfully left. 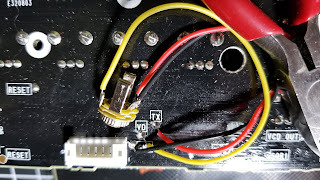 You can find them right next to the Molex plug that connects both boards. Then I soldered each wire to its proper pin on the TRS jack I was using. In case this is your first outing, TRS stands for Tip, Ring, Sleeve, describing the poles on a typical stereo plug. You really only need three poles for your 5-pin MIDI, so it's okay. I ended up using the open jack in the photo because a) I had them lying around from another project and b) it was a bit shallower than the full-case version, giving me about 2mm of clearance once the Volca was reassembled (there isn't much space in these things at all). 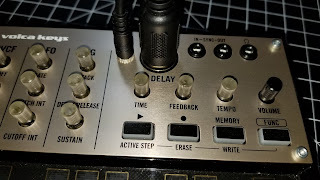 If you want to use a Korg-specific 5-pin cable or adapter, just swap the TX and VD wires. The tricky part is drilling through the case of the Volca. I ended up drilling a pilot with a smaller bit, just to make sure everything was lined up properly, stepping up the sizes bit by bit (literally) until I had a hole large enough for the threaded part of the TRS jack. If you try drilling right away with the largest bit you need, you run the risk of catching it on the plastic or metal and messing up your nicely placed drill hole. The issue I then ran into was that the jack wasn't long enough to reach through the Volca's case, which was a thicker layer of plastic and the slightly thinner metal faceplate. If you run into this issue, remove the metal faceplate (be careful, since the hex screws are held in place with small black nuts that will go away quickly if you don't hold onto them). With the faceplate removed, widen the hole in the plastic until you can fit the body of the TRS jack through. Sorry, I didn't take photos of this part, but you want the main body of the jack to fit through the plastic and mount only to the metal faceplate, which is rigid enough to keep it pretty solid. Mount the jack in place and reassemble everything, making sure none of your wires are pinched. Remember to plug the Molex back in. 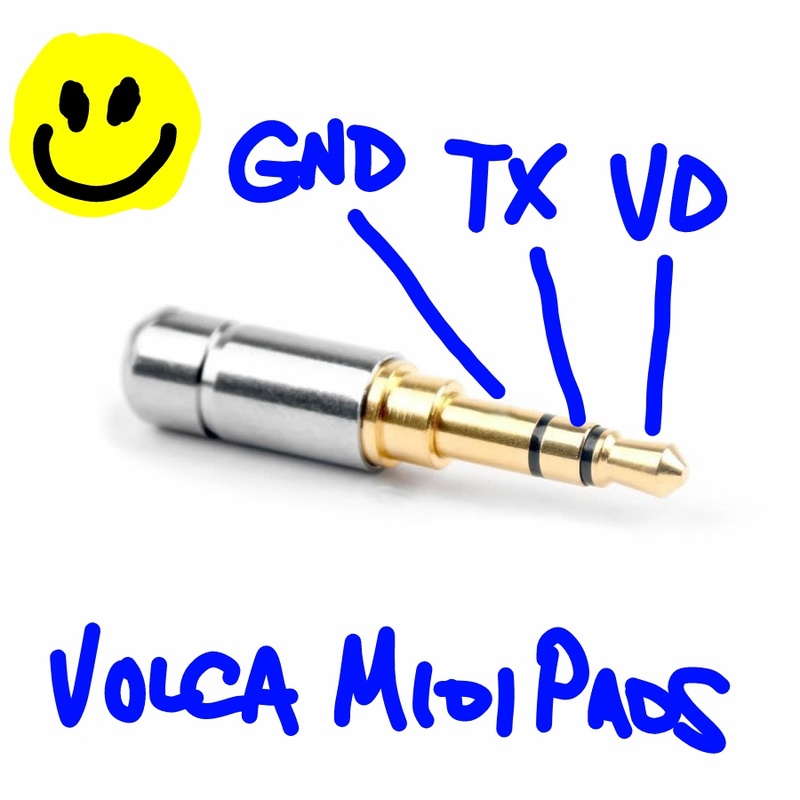 Then plug in your adapter and use your Volca Keys as an on-the-go MIDI keyboard for another synth! It's especially nice to have it hooked up to a Monotribe (with its own MIDI modification) so you can play actual notes instead of relying on the ribbon keyboard.